To guarantee straight-line feed of the panel, a double row of rubber rollers is off centered onto top pressure beam and bottom feed track with rubber calibrated pads is running on cylindrical guide. The feed of edging material, by strip or coil is automatic and synchronously with panel feed. 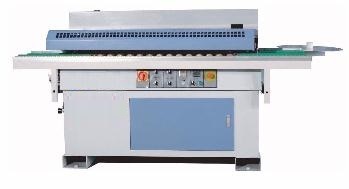 Gluing Unit: With the use of melt glue applied on straight Panel for edges banding.